Along with Grand-Puy-Lacoste, Château Calon Ségur is the first ‘top’ Left Bank 2009 claret to be released En Primeur today. UK merchants are offering the wine at around £600 a case, in bond (ex-duty and Vat), two years before delivery. Blimey. I thought the 2009 was a fabulous wine when I tasted it in April, and rated it 92-95, while Robert Parker gave it an almost identical 92-94+. Jancis Robinson awarded it a very high, for her, 18/20. But ‘sold out’ at £600 seems crazy in the context of earlier vintages. 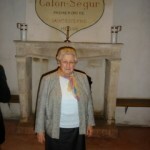 Calon Ségur, owned by the formidable Madame Capbern Gasqueton, right, is a traditionalist’s favourite and patience will be required – drink 2023-2040+. In 2009 there is a whopping 90% Cabernet Sauvignon in the blend, compared to 82% for the 2008, and by my calculations, they made about 15,000 cases of the first wine: with 46 hectares in production in ’09 from 55 ha overall, and yields of 53hl/ha, 58% went into the Grand Vin, 25% into the second wine and the rest a third wine. 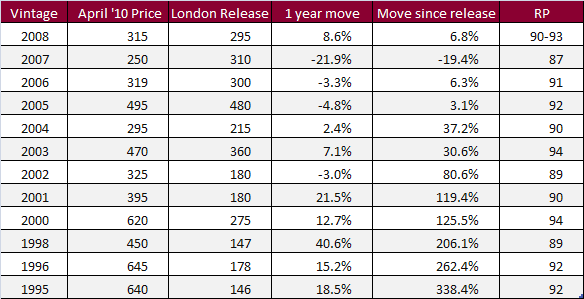 The release price from Bordeaux from négociants (the Château only sells through the Bordeaux network) is €51.20, a rise of 109% on 2008 (€24) and 5.5% on 2005 (€45.50). Whilst this is a modest rise on 2005, we shouldn’t forget that the 2005 EP price was way over any other vintage before or since, until now. What I would say is that if you’re a buyer, don’t expect it to be a short term investment, much like the wine itself – unless Parker gives the wine 95 in bottle in two years’ time, which he might well do, or the Chinese get a taste for it. 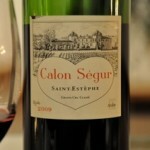 Calon Ségur has usually proved to be a solid purchase En Primeur but at a much lower starting point. It is, though, an old estate on the up, especially since Mr Millet arrived from Château Margaux in 2006, and there is a great deal of replanting going on. Take a look at the table below from Liv-Ex, and you’ll see that the 94 point 2000, with years of bottle age, costs the same as the 2009 today, and the 94 point 2003 costs a lot less. The Calon Ségur 2009, aged in 100% new oak, could turn out to be a great wine once in bottle but, judging by the chart, you have to be very confident in the future price of wines from this estate to think that the 2009 is going to increase significantly in value in the medium term. If that is the case, some older vintages will look cheap.